You can quickly learn the Olympic sport of Judo from the basics right through to the more advanced techniques with the five resident and highly experienced instructors at Aylwin Judo Club. The five instructors have expertise in Technique, Contest and Kata training and regularly teach on courses throughout the UK. 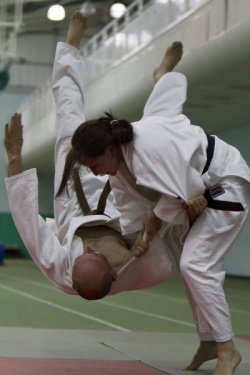 Aylwin Judo Club is open on Tuesdays and Thursdays and is located in Southwark Park Road London. Make Judo your "Whole of Year" Resolution and get ahead THIS Year! We often run beginners only classes so just register and we'll let you know the dates. You can attend dedicated classes as a complete beginner or someone returning to Judo after a long break. Of course, you're more than welcome to come and join us NOW and get ahead. Whatever your level of experience simply visit our registration page and sign up. If you would like to visit our club then please just turn up on a training night (Check the scrolling messages at the top of this page for closures). No appointment neccessary. We will always be happy to see you. Further details on times, fees and directions. 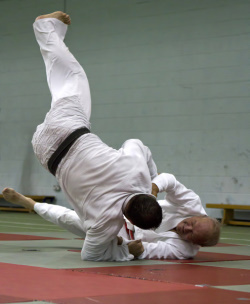 Are you aware that judo encompasses many other martial arts such as Aikido, JuJitsu, Karate and Kendo. So, do come and join us if you practice another martial art. Photographs reproduced with the permission of Blink Films UK. Aylwin Judo Club were filmed for the Channel 5 Show, How to Take Stunning Photographs, Episode 4, Action. Above are 2 of the photographs that were taken for the show. To see more photo's (and larger) and the link to the Channel 5 website for the whole episode. At Aylwin Judo Club we would be very pleased to see you either as a complete beginner or as an experienced dan grade. We are closed during local school holidays so please check this site for details. Aylwin Judo Club has been in existence for over 40 years. Founded by Sensei Richard Raymond, 6th Dan, the club was based at the Aylwin School (Now Harris Academy) in Southwark Park Road, London, SE16 2JP. Aylwin Judo Club moved to the present location in 1997. As of February 2012 Aylwin Judo Club instructors possess between them 170 years of judo experience. Their grades range between 1st Dan and 6th Dan. All have attained at least FPJ level 2 coaching qualifications, have had Criminal Records Bureau (CRB) checks completed and hold first aid qualifications. In addition to our resident instructors at Aylwin Judo Club we also have two 5th Dans who are regular visiting instructors.